Finally got out this Winter. Between a full time job, a part time job and keeping the fire going at home I haven't had a lot of time but I got a chance this weekend. Saturday my dog, Henry, and I made our way up to the Third Fork of Rock Creek. I was needing to get out so I could finish my AMM requirement of making a camp in all four seasons. I set up camp and then explored the surrounding country. Found some trails I'll have to explore come Summer. Also found some beaver ponds so I might have to come back and lay some traps. As the day grew late I went back to camp and started a fire. I prepared supper and enjoyed greatly having warm food in my belly. With the daylight fading the cold grew bitter and I huddled closer to the fire. During much of the night I sat by the fire dozing for that was the only real heat I could acquire. Sometimes I would crawl into my buffalo robe with the dog and we both tried to keep each other warm. Needless to say it was a long night. Daylight came none to soon and I rolled out of bed when the dog left me to go relieve himself. Breakfast was made and I raised camp and made my way backdown the mountain. Come to find out the temps were down near zero down on the flatlands which meant it must have been in the negatives up on the Third Fork. Now I see why the old mountaineers tried to stay holed up in the Winter! Hurrah for mountain doin's! I did a bit of winter camping in my younger days, but never with primitive gear. It was rough enough with modern (loose term). Let's hear it for the young and tough!....How's that little guy doing? You're tougher than I am, Idaho. Boartooth, The little guy is getting bigger daily. Here in a couple of months he will be a big brother. Can't wait until he is old enough to take to the trail with me. Wow,Another li'l hunter coming soon.Don't let them get hooked on electronic toys...Make them use their imaginations...teach them to hunt...Did I hit all the "old peoples' talking points"?...I wish my kids would give me grandbabies....You are in the Greatest Days of Your Life.Enjoy those babies,then kids,then young adults.My Granddad told me these years go racing by....And of course I didn't believe him,even tho he was right. Big Congratulations on completing your final camp. Turn those papers in and make it real. Wow, some very nice camera work. Funny how us Easterners think that very cold = very deep snow. How do you like that Traditions PA Longrifle? I've bookmarked your blog as well. Need something to keep me from going stir-crazy here, just North of DC. I can only be envious of your primitive camping and mountaineering. I would love to do what you are doing. I did some modern-style winter hiking and camping in the 1970's. I had the advantage of using down jackets and nylon tents. Still, it was an adventure that I thoroughly enjoyed. I am glad you enjoyed it even with the cold temps! Dave, I really like my traditions because it's not a 1,000 plus dollar custom rifle and I don't mind it getting a few dings in it. It shoots good too. Ron any time spent in the woods, primitive or not, is a good time to me. I've come to the realization that one is not a woodsman just because he can sleep out in whatever conditions. Any idiot can do that. 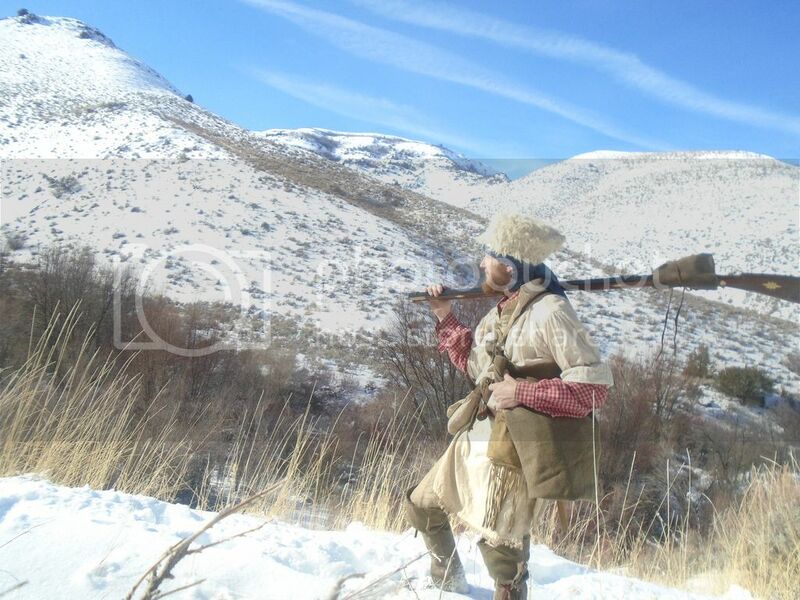 I think one is a true woodsman when he can camp in whatever conditions and do it in relative comfort and with minimum gear, whether that gear is modern or historic. If I remember correct (IIRC), I think Bradford Angier once wrote something like, "I don't go to the woods to rough-it, but to see how well I can live; To smooth-it." A paraphrase, I think, from Survival with Style 1974. ??? A few years back when I was younger I went to a reenactment that was to set up a winter camp using pick-axe, axe and pack shovel and turn an A frame tent, timber and stones into a CW winter camp in frozen ground. We started in the morning and had dug 2 ft down, lashed the timbers to make 3 ft walls with mud and grass for chinking, built a fireplace using the flat stones and mud and the chimney was mud coated timber to come up past the A tent which we used as a roof to draw off the smoke. We had it done by dark and 4 of us slept well enough just took turns feeding the fire. Another crew set up their A frame, dug a trench from near the tent door down the center of their tent, past the back of the tent and used mud coated timber for a chimney. the trench was covered with flat stones, mud and was covered with dirt. The fire pit was flat stones and mud. They slept on top of the trench and it seemed to draw the smoke well enough. There were some who didn't fair so well. Had a good time but it was work I'll tell you that. My hat off to those soldiers who survived in those conditions. Families sleep peaceably in their beds at night as there are rough men about who will do violence in their behalf. Awesome picture! The first deer I ever killed with a flintlock was with a rifle like you are holding.